Osteoporosis is widely thought to be an affliction of elderly women, but it frequently strikes both men and the non-elderly as well. It is also widely thought to be incurable and irreversible. These too are both wrong. Osteoporotic bones lead to the reduction of stature and the hunched-over appearance that everyone is familiar with. This is tragic, but made even more so by the fact that it is 100% preventable. Osteoporosis is caused by a lack of calcium and other minerals in the bones. This causes them to weaken, eventually to the point of not being able to support the weight their owners place on them. At this point, they start to crush in on themselves. This is called the “fracture threshold.” Bones in this weakened state are also much more likely to break in a fall. Most people’s knowledge of bones comes from the remains of a meal, or from those that amuse their dogs. They are seen as hard, rock-like, hollow, and inert. They look like they will last hundreds of years. These are dead bones. If they have been outside for a while, all that’s left is the calcium deposits that made them so hard. This is deceiving. A bone is quite complex, and is often considered an organ. Besides providing structural support, it also acts as a mineral depot and houses the cellular factory that manufactures red and white blood cells. It has an elaborate blood supply and is continually tearing itself down and rebuilding itself. A live bone is a lot stronger than Rover’s plaything. A bone is constructed rather like a steel-reinforced concrete pillar. Concrete is immensely strong under compression, but not strong at all if pulled apart: a tension-type stress. For this reason, reinforcing steel bars, called rebar, are embedded in the concrete pillars to provide the needed tension strength. Civil engineering copied this from bones. The hard mineral part of a bone is quite strong for compressive forces. It’s built around a cellular-generated matrix made of collagen, which has enormous tension strength, just like the rebar. Ligaments and tendons are also made of collagen. Collagen is made of fibrous strands, and for its weight, is actually stronger than steel. Those “iron men” have got nothing on us ordinary folk. This structure is maintained by a busy construction crew of bone cells, both on the surface and on the inside of the bone. Some build new bone, some remove old weaker bone. New bone tends to be made where it is needed. 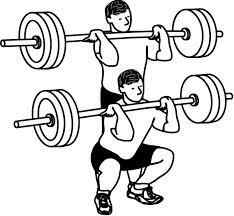 A weight lifter will build new bone in his or her back and legs. A jogger may develop new bone in his or her feet. These are easily seen on X-rays as striations of calcium. The body knows where to build bone because of an amazing property of collagen. It is piezoelectric. Remember piezoelectricity from high school physics? If you put pressure on a piezoelectric crystal, an electric field results. Bone is built over a scaffolding of piezoelectric collagen. Where bone is weak, the collagen scaffold gets pushed and twisted and creates an electric field that attracts new calcium and other minerals. Bone is torn down for two reasons. First is repair. Although fractures are rare, micro-fractures are common and inevitable. They are just what they sound like. Second, if the body needs calcium, it will tear down bone to get it. How Is Bone Renewal Regulated? 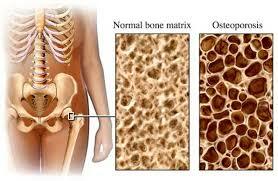 If more bone is torn down than is constructed, the result is osteoporosis.About 10% of bone is renewed per year. Bone density peaks at about age 21 at around 200 mg/cc. These are strong bones. Beyond this point, the body starts tearing down more bone than it is building, losing bone at a rate of about 2% per year. At first this has little effect, but eventually, bone mineral density is down to around half, at 105 mg/cc. This is the fracture threshold. The bones can no longer support the weight required of them, and start to crush in on themselves. This is osteoporosis and can happen to both men and women. 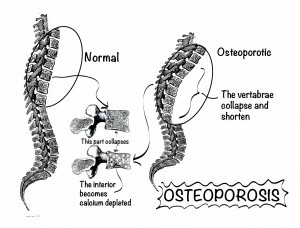 To stop and reverse osteoporosis, we must reverse the tear-down/build-up ratio so that we get more build-up and avoid osteoporosis. Exercise does just this. It tilts the ratio in a positive direction and thus grows and protects our bones. In fact, it can swing that ratio quite quickly. A three-month resistance exercise program will build bone and have significant, measurable effects. We do not have a clear picture of exactly how the tear-down, build-back-up process is regulated, but the growth hormones that accompany exercise probably help push it over the threshold so that more new bone is built than destroyed. Whatever the causes, for virtually everyone, building exceeds tear down if proper resistance exercise is undertaken, and since more new bone is being built than is being torn down, osteoporosis is being reversed. The presence or potential risk of osteoporosis is determined by measuring bone mineral density using X-rays. A full-body scan in either an EBT or 256-slice CT machine normally measures the density of three vertebrae. For most people, 105 mg/cc is the fracture threshold, but this is not a firm line. A person is already in trouble at 135. It is important to catch this before any collapse has occurred. It can then be reversed and avoided for life, with no loss of stature. Low bone density is an expected side effect of celiac disease. Hence, if there is suspicion of osteoporosis, it would be a good idea to test for celiac disease as well, and vice versa. The circulating calcium is tightly regulated and will remain constant. (This tight regulation is critical for proper functioning of neurons and muscles.) In this scenario, no new bone would be built. However, since circulating calcium is available, less calcium will be removed from the bones, causing less bone to be torn down. This has the effect of slowing down osteoporosis, but doesn’t cause new bone to be built, kind of a mixed benefit. The bones basically aren’t really any stronger either. All this would probably be mildly beneficial, but in fact, calcium supplementation increased heart attacks 17% in one study. 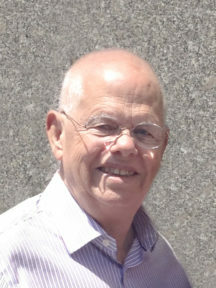 At low vitamin D levels, calcium supplements no longer work, so vitamin D supplementation is often prescribed as well. Vitamin D may cancel out the negative cardiac effects of calcium supplementation alone. Rather than playing dangerous games with calcium in hopes of retarding bone loss, a far better strategy is to grow new bone by up-regulating the entire remodeling process with exercise. It doesn’t take enormous amounts of exercise to accomplish this, just exercise of the proper sort—resistance exercise that stresses the big bones. 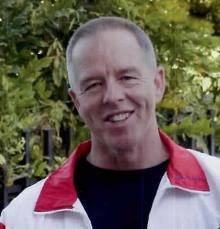 With such an approach, the disease is reversed rather than merely retarded, and no risky meddling with a critical bodily regulation system is needed. If vitamin D levels are low, supplementation would still be a good idea, but without the calcium. Or better still, get more sunshine. Sunshine has many benefits beside vitamin D.
Bone can be built by stressing the big bones: the spine, legs and hips. This means proper weight bearing exercise; not just jogging, for example. This will turn on the growth hormones and up-regulate bone remodeling, building new bone, reversing and curing osteoporosis. The best exercises for this are squats and deadlifts. Doing three sets of ten each, once a week, correctly and with whatever weight represents a safe challenge, will effectively stop and reverse osteoporosis. Both men and women should do this. I’d love to do this but my left knee is always very swollen I’ve had an arthroscope and a patellar terai release I have baker cysts and fluid all around the knee. I’ve had ft knee srthoscope too but it’s ok. I have lost 2 inches in height and am told I have severe osteoporosis I don’t want to take drugs I don’t know if they will worker make me worse. I just had a tumor removed from my spinal bird and a fusion and fixatio of t 12 l 1. Help please the surgery wasMay 12 2015 any suggestions?